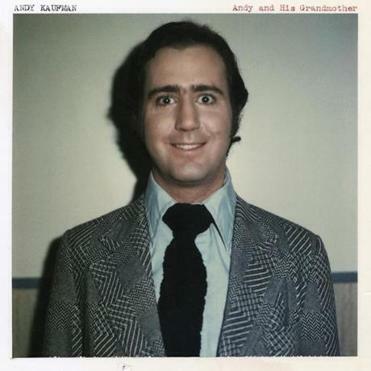 The subject of faking his death comes up late on Andy Kaufman’s “Andy and His Grandmother,” the comic legend’s posthumous first album. It happens during a phone conversation between Kaufman and an associate, probably his frequent coconspirator Bob Zmuda, about an album of real-life conversations Kaufman wanted to make. A former girlfriend angrily demands Kaufman hand over the tapes that feature her, but Kaufman refuses, while recording the conversation. He thinks he has a great album on his hands, which would be even better if the woman killed him and the whole story were captured for posterity. The conversation then turns to how Kaufman could find immortality if he faked his death. No one would believe he was dead. It’s an intriguing end to what is undoubtedly one of the strangest albums in recent memory. Kaufman died of lung cancer in 1984, and never got to make an album in his lifetime. But between 1977 and 1979, he recorded 82 hours of conversations and comic sketches to draw from. It’s hard to know exactly what the album Kaufman wanted to make would have sounded like, but editor Vernon Chatman (co-creator of MTV2’s “Wonder Showzen”) waded through all of the tape and came up with the perfect tribute. He strikes exactly the right tone, with an appreciation for Kaufman’s ability to provoke anger as much as laughter, adding a few sound effects and some voice-overs with Bill Hader. Apart from a sketch called “Andy Can Talk to Animals” featuring an angry phone call with a pig, very little of the album is played for obvious laughs. There are cute and prankish conversations with Kaufman’s grandmother, including one where he takes her for a ride in his car and winds up in a shouting match with a police officer. Those share space with a postcoital discussion between Kaufman and a lover that covers favorite positions and the possibilities of abortion and marriage, a scene in which Kaufman asks prostitutes out for bowling and pizza in a gimmicky character voice, and a more conceptual, absurdist bit of comedy meant to be enjoyed only by the sleeping. The heart of the album is a series of conversations with two women in a love triangle with Kaufman. He says at one point that those are the best, most dramatic moments, and also the conversations no one wants him to tape. Indeed, there is one track devoted solely to people yelling at Kaufman to shut off the tape recorder. The screaming and fighting is absolutely cringe-worthy, with a touch of slapstick when each woman’s name is replaced with sound effects of a dog barking or a honking horn. It is hard to tell if the participants are really angry or have just decided to play along to assure their role in the show. But that’s exactly how Kaufman liked it. And it fits perfectly with the current emphasis in comedy on the awkward and uncomfortable. On a logical level, it would be absurd to believe Kaufman was able to fake his own death and remain in hiding for almost 30 years. But wouldn’t it be wonderful if he had? Wouldn’t it be satisfying to that little part of the soul that atrophied with the revelation that Santa Claus isn’t real (sorry, kids)? That’s where a lot of Kaufman’s appeal ultimately lies: his playful but provocative put-ons, seeing what he could get away with. Kaufman didn’t tell jokes. He pulled stunts and invited the audience to believe it or not, Ultimately, it didn’t matter which; the trick was to engage them in the argument. The trick was the doubt. Long live Andy Kaufman.